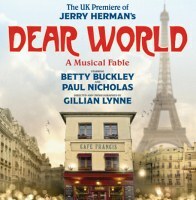 Tony Award winner Betty Buckley is starring in the revival of Jerry Herman’s Dear World at the Charing Cross Theatre. It will play there from 1st-February-30th March. The production will be directed and choreographed by Gillian Lynne, who helped guide Miss Buckley to a Tony Award for her performance as Grizabella the Glamour Cat in Andrew Lloyd Webber's Cats. Miss Buckley will play the role of Countess Aurelia, the part created on Broadway by Tony winner Angela Lansbury when it opened there in 1969. She will be joined by Paul Nicholas/Sewerman, Katy Treharne (The Phantom Of The Opera)/Nina, Stuart Matthew Price (Sweet Smell Of Success, Mack And Mabel, Shrek, Parade)/Julian, Anthony Barclay/Prospector, Rebecca Lock (Avenue Q, Martin Guerre)/Gabrielle, Brett Brown/Waiter, Paul Hawkyard/Sargeant, Peter Land/ President, Robert Meadmore/President, Jack Rebaldi/President, Annabel Leventon/Constance, Ayman Safia/Mute plus Joanna Loxton and Craig Nicholls. Set in post-war Paris in 1945 the musical is described as “a musical fable of Good versus Evil is a tale for our times, with only a madwoman and her odd collection of acquaintances to save the city from corporate greed." It is based on Jean Giraudoux's "The Madwoman of Chaillot”. Miss Buckley received her second Tony Award nomination for Best Actress in a musical for her performance in Triumph of Love, and an Olivier Award nomination for Norma Desmond in Sunset Boulevard which she also appeared in on Broadway. Her other Broadway credits include 1776, Pippin, Song and Dance, the Mystery of Edwin Drood and Carrie. Her latest CD, "Ah Men: The Boys of Broadway" was released in August.